I’ve been thinking for a while about riding to the Pennsylvania border and back, just for the sake of doing so. I’ve also got a loop route in mind to Newton Falls and back that I’ve been thinking about doing. I set out on my bike this morning later than I had planned, and so actually had a cue sheet for the Newton Falls loop in my pocket. A few miles out from home, though, and I got to thinking that since it was such a nice day, and I was feeling good, then what the heck–I’ll head for the border. Another incentive was that the ride to PA would be at least 50 miles of roads that I had never ridden before, whereas the Newton Falls loop would have had only about 20 new miles about of 70. The most direct route to the state line from where I live is east on State Route 82. I don’t usually think of that road as an ideal biking route, as it usually conjures up images of the strip mall towns of Macedonia, Brecksville, Strongsville, etc. But, when heading east, once you get outside of Aurora, Route 82 is relatively quiet and pleasant. The only real kicker is where the road crosses the Cuyahoga River just west of Hiram–there’s a long descent down into the river valley, followed by the long slog back up the other side. At the main crossroads in Hiram, I stopped at the Hiram Cafe on the corner for a snack. I bought a candy bar and a bag of peanuts, which came to $1.78. I had a $1 and a $20 bill on me; the cashier offered to just take the $1 bill and pulled three quarters from their “Take a Penny – Leave a Penny” tray, but I said, “That’s okay,” and just took the change for my $20. Here at this intersection in Hiram, Route 82 makes a right turn as it runs concurrent with Route 700 South, then bends back east through Garrettsville and beyond. I proceeded straight through Hiram instead, where the road becomes State Route 305, continuing my beeline for the border. 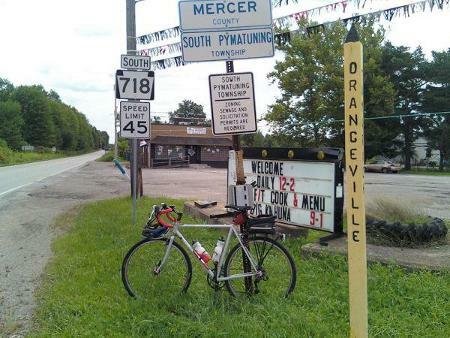 The route has a few more hills, until right about the time you cross from Portage County into Trumbull County, where it becomes pretty much dead flat. I went through several small towns that I had heard of, but never been to, like Nelson, Parkman, Champion, and Cortland, and a few that I had never heard of, like Bazetta, Fowler, and Hartford. The only real hill on this section was a not-too-steep quarter-mile climb about three miles before the state line. I didn’t know what I’d find once I got to the border. It turned out to be as nondescript as a road map view of it would indicated. There’s a five-way intersection, with the main north-south road making the state border. On the Ohio side is a gas station with a convenience store and ice cream stand. On the Pennsylvania side is a bar called the 5 Points Tavern & Grille. I wanted a lunch more substantial than convenience-store snacks, so I opted for the 5 Points Tavern. Plus, I figured I pedaled all this way (not quite 54 miles) to get to Pennsylvania, so I may as well dine in Pennsylvania. The tavern had the look of a rough biker bar; the kind of place where the jukebox goes silent and every head turns your way as you walk in the door. There weren’t any Harleys parked outside at this time, though, and they had a sign by the road promoting their new full-time cook and menu, so I figured they were trying to look welcoming and it was safe for me to go in. The walls inside featured hand-printed signs highlighting the menu specials: chili dog, cheeseburger, tacos, but the one that caught my eye was the lasagna. The problem was, there wasn’t another soul in the place. I walked into the back room with the pool table, even tried to peek into the kitchen behind the bar to see if there were anyone whose attention I could get. I sat for about five minutes and was about ready to give up and leave when a woman finally appeared from out of the back. “Is the kitchen open?” I asked. “It is as of right now,” she replied. I ordered up the lasagna, plus a Yuengling draft to wash it down. Another woman appeared while I was waiting for my lunch to arrive; she sat at the bar and continued drinking a can of beer that had been sitting there, so I figured she was a customer, but later she got up and started sweeping the floor and doing some other cleaning around the place, so she was an employee, too. They both recognized my bicycle helmet, and so asked me about where I had come from, and if I were doing some kind of cross-state tour. “No, just out for fun for the day,” I said. I asked the second woman, “What town am I in?” She said, “Well, that’s a good question. This is South Pymatuning Township, but the mailing address is Sharpsville. If you have a landline, you know, a regular phone line from the local phone company, it’s a Transfer exchange.” I thought “transfer exchange” was some kind of arcane phone system terminology, but didn’t bother trying to go into the details with her. I found out later that Transfer is the name of another nearby Pennsylvania town. The lasagna was as good and plentiful as I had hoped, and came with a salad. Some time later, I noticed all of the women, including the young girl, had lit up cigarettes. This struck me as odd at first, until I remembered that this is still allowed in Pennsylvania. It was at this time that I also decided that the young girl was probably older than I had originally thought, and was also an employee, probably killing time before the start of the busy shift later in the day. As I finished up the lasagna, I turned down the first woman’s offer of another beer, but accepted her gracious offer to fill up my bottle with some ice water. They wished me luck and a safe trip as I headed out for the ride home. I followed the same route back as I had come. I was due for more fluids as I got back to Hiram, but the Hiram Cafe was closed now. I went up and around the next corner, and fortunately, the Gionino’s Pizzeria had PowerAde in their drink cooler. I was right in the thick of rush hour as I made my way back through Aurora on Route 82, but it wasn’t any problem. I had almost 107 miles on my computer when I got home. I’d recommend the Route 82/Route 305 route for anyone looking for an uncomplicated way to go east from the southeastern suburbs of Cleveland. It would be a good route for multi-day touring, with several camping options along the way, such as Nelson Ledges State Park, Mosquito Lake State Park, the Jellystone Resort outside of Aurora, and one or two other private campgrounds that I noticed along the way.